You are here: Home / Behavior / Female Betta Blowing Bubble Nest. Female Betta Blowing Bubble Nest. Trad PK Copper M – Betta-Online, originally uploaded by Daniella Vereeken. I have a strange problem; my female Betta is making bubble nests (unless I have a male with VERY short fins). I had a male and female in an aquarium together for almost 10 months…not a nipped fin or hint of a problem. She tore the male up about three months ago. I found him floating on top, on his side, all his fins well ripped up. He survived and with some meds and extra heat. He is doing fine. Anyway, the male has stopped making nests. I am keeping them in separate gallon jars next to each other. They seem to interact but he hides from her. She has made a couple of nests; the bubbles seem to be smaller than in the nests the male made. What do you make of this? What is your feeling on luck bamboo? I have kept fish in 2 gallon jars with “bamboo” for years with no apparent problems. I do pull ALL of it out and wash it every week. I have put it in aquariums for years when I don’t have it filled to the top. A: There are a couple of possibilities here. First, there are short finned male Bettas. They are commonly referred to as Plakat (pronounced pla-CAT) bettas. This body type is closer in appearance to wild Bettas, which traditionally have short fins. Bettas with long flowing fins, like those you see most often at aquarium stores, have been selectively bred to have unusually long finnage. While unlikely, it is possible that you purchased yourself two male Bettas, one being of the short-finned variety. The only way to be sure that your Betta is a female is to look under its belly for an ovipositor. The ovipositor is a small tube from which female bettas dispel their eggs. To the naked eye, it looks like a small white dot located behind the ventral fins. Only females have an ovipositor and it is the only true-fire way to know that your Betta is a female and not a Plakat. Another possibility is that the bubbles you are finding are not the result of your fish trying to create a bubble nest and are rather the byproduct of your fish breathing from the surface. All Betta splendens are labyrinth fish and get the majority of their oxygen from breathing air from the surface. Bubbles will frequently escape from the fish’s mouth, unintentionally rising to the surface and collecting. These bubbles can begin to pile up and look somewhat like a small nest, especially if your aquarium water is very still. It is possible that the collections of bubbles you are observing are just the result of escaped air and are not an intentional nest for the purpose of breeding. As for your question regarding bamboo, I am not opposed to bamboo in the aquarium as long as it is kept healthy. Bamboo is technically a terrestrial plant but can survive for a long time partially submerged in water. If not maintained, however, the roots and stalks can begin to rot, leaching poisonous toxins into the aquarium. Continue to look it over during your weekly water changes and remove any bamboo that appears to be decaying and your Betta should be fine. Uh, between the two long ventral fins on its belly… Next time you look for a female betta, look between there, there should be a white thing there where she lays her eggs. yes thats a male i bought one at petsmart they said it wass female.. it wasnt.. but i have a female she wont mate w my male. the first time he messed her up bad. she is now makin bubble nests too though.. so im confused..
oh yeah that kind of betta is used for arena fighting theyre fast and ruthless. My female Betta is also making bubble nests and i just saw her flare up at the male, but i looked between her fins and she has a white dot. i am kinda worried to try to breed them. My male also looks like he is a little scared.. of like everything in his tank haha so i am confused… Is it possible my “female” is male and female(just kidding) but what is up with this? I have a Crown tail female and a Crown tail male. And I have them in their tanks next to each other. The female is full of eggs, but the male isn’t making a bubble nest and he keeps flaring at her. Can you help me? I have had a few females that made very small nests. It is not a common behavior. One female would even build a small nest and then she would drop her eggs (without a male) and place them in her “nest”. I have also had pairs breed where both male and female would pick up the eggs and put them in the nest…also not common but it can happen. I have a female betta fish and whenever I feed her she wont eat the flakes. She will only eat the things that I give her. She has also been putting bubbles all over the tank. Is it possible that she could have been overfed where she came from? I checked and she does have a little white dot. Could she be one of the fish at the store that was perganent when I bought her? How would I know if she was preganent? Betta Fish do not get pregnant. They lay eggs, also idk if im right but im pretty sure most betta eat pellets? Not flakes. I feed mine pellets and she is all good..
yes they will survive its better to have a plant for decor ! the female doesnt make the nest the betta male does unless you put the fish in the same tank.Than its a different story. my male betta made an amazing bubble nest and he worked on it for a few days and then he started rubing on it like he was pushing it together of trying to distroy it dose any one know why? betta fish have to have air above them so they can breathe. they breath through an organ called a labrinth. they sleep at the top of the water so they can get oxygen. Well, looks like i’m not the only one. That’s a male for sure 99.99% sure. I have one just like that one, the one in the picture. In my opinion males has longer fins if short tale. 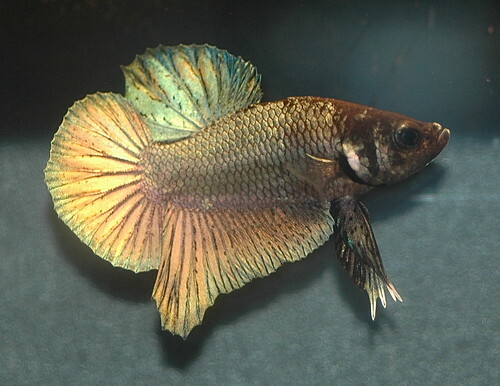 That betta is called: Black Copper Halfmoon Plakat. I have had my betta in a round tank for 8 or 9 months starting in a small “vase” until I saved up enough to buy a 3 gal round tank and he is doing great and enjoying his larger tank now. My male and female are in the same 2gal tank and ive had them for little under a week now and my female has started to chase after my male and lach on to his fins. Help i dont want something to happen. it’s the same with me my female betta fish keeps making a bubble nest. the female is a dumbo ear. the females bubble nest is for nicer than the masles bubble nest. i am having trouble believing that my female could not be a female. am i wrong or is it a very good female betta who makes bubble nests,.